Four Columbia River Tribes are voicing their strong opposition to Nestlé's plans in Cascade Locks, joining the thousands of Oregonians who have been fighting this proposal for the past eight years. As Bark reported in June, despite a vote by Hood River county residents banning commercial water bottling, the Oregon Deptartment of Fish and Wildlife is still moving ahead with the transfer of public water to facilitate a Nestlé bottling plant. 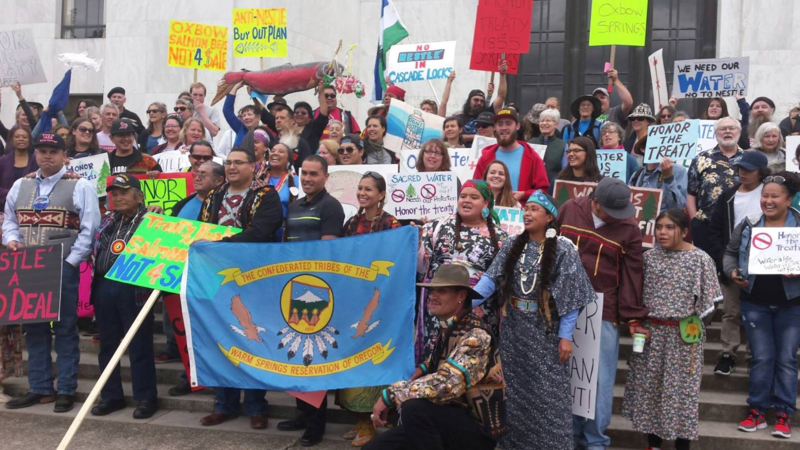 Next week, when the state legislature is in Salem, Anna Mae Leonard, a Clakemus Chinook, Kalapooya and Wiswarm resident of Cascade Locks, will hold a five-day fast at the Capitol in protest of Nestlé and in solidarity with the Standing Rock Sioux. This is a key moment for us to support indigenous allies, and to ensure that Oregon's elected representatives know that the Nestlé plant would violate treaty rights of the Four Columbia Tribes (see below for a letter from the Yakama Nation opposing the bottling plant). Support Anna Mae Leonard's courageous protest next week: join her in Salem, spread the word, and support her with a donation to cover travel costs and other expenses. After all the fighting, and all the wins, Governor Brown can and should cancel the water transfer permitting process once and for all. With so many voices in Oregon rising together to protect our water, the time is now!